Just as we previewed, T-Mobile has confirmed the availability of a new Unlimited Nationwide 4G data plan for no-annual-contract customers beginning tomorrow, January 9th. The $70 per month plan replaces the current $70 Monthly4G offering which caps data at 5GB. The new plan will be available through T-Mobile retail stores, select dealers and national retailers. Today at the 2013 International Consumer Electronics Show (CES), T-Mobile USA, Inc. announced an industry first — its popular Unlimited Nationwide 4G Data plan will be available with no annual contract starting tomorrow, Jan. 9. T-Mobile is the only U.S. carrier to offer an unlimited, nationwide, 4G data plan on a fast, dependable, nationwide, 4G network, giving customers the ultimate worry-free experience with no data caps, overages or bill shock. For more information regarding T-Mobile’s lineup of no-annual-contract smartphones, visit http://prepaid-phones.t-mobile.com/. can u have wifi hot spot thingy with this plan? i’d put my money on no. The page specifically says hotspot is not available. Not that it’s going to stop people who know how to get around the upsell page. Their tethering detection system reads the user agent information sent from your browser. If it detects a PC browser like Firefox, Chrome or IE, it sends you to the tethering upsell page. I use USB tethering through PdaNet since it has a setting to strip out the user agent, but you can also change the user agent manually or via browser plugins. Just google the name of your browser and “user agent”. I have the 30$ 5gb plan and whenever I tether I get the message to get T-Mobile hotspot If I use Firefox, internet explorer or chrome, but I don’t get the message when I use opera browser and can surf the web just fine. I tried to explore where the limit on T-Mo Unlimited Nationwide 4G last month by initiating a download in the backgound with linux kernel, from distrowatch.com and also streaming netflix movie, the longest day, on the foreground and could only consume 200GB last month. Anyway, the gripe now is that for some reason, after side loading Adobe Flash, and browsing Youtube in desktop mode, I’ve been flagged as Tethering, kept getting upsell message. Tech support are clueless, was adviced to call Samsung maybe my Galaxy Note 2 is defective. Streaming youtube video in desktop mode on T-Mo network is block. Works on my wifi though. David I’m on the 70 dollar prepaid plan already for the 5gb. will I have to call and say I want unlimited or will it already be placed on my phone? You always need to call to change the plan! how do we go about activating this? I just got off the phone with T-Mobile prepaid customer service and they said they didn’t know anything about it…even tried to tell me that I am wrong…I did however see, that on the T-Mobile prepaid website they are also already advertising…I am so confused right now, and quite annoyed…any help or info is greatly appreciated! They launched it a few hours early, so the agents may not know about it yet. I’d wait until after midnight Pacific time to change, so it won’t count Tuesday as the first day. it is now 0:15 AM PST….still unable to switch! I called and switched. The rep assured me it was the truly unlimited, but my online account still says the 5GB limit. If it’s still saying that tomorrow I’ll call them again. I’m just so happy over the prospect of not having to watch my data like a hawk and not having to make sales calls on a PBD line. I just wish the information had come out a day earlier so I wouldn’t have paid for January on the 100 minute/5GB plan. Oh well. the reps have no idea what they are talking about…I have called and chatted numerous times, all of them told me there was no such plan…after referring them to go to newsroom.tmobile.com and to read the statement and to inform themselves that I am actually right and they are wrong, they all got quiet said they don’t know…I just got off the phone and was told it was the 10th…. (which is not the case)….if logging in to my.t-mobile.com change plan, I do not see any $70 plan anymore right now, it has been removed, the website has also been offline a couple of times….they are in fact doing something and I am hoping it will be available shortly!! Shame on T-Mobile for charging $15 for mobile hotspot without doing anything. I’ve been a customer going on 6 years now… do I have to call in and change my plan? And if so wouldn’t that cause an early termination fee? This makes no sense for loyalty customers. Yes, going to prepaid will cause an ETF if you are under contract, but postpaid customers already have essentially the same deal. Just call and have them add the truly unlimited feature. If you’re on an old rate plan, you’ll need to switch to one of the current plans to get it. Give it some time ppl its just been launched. They may have not put the info in the whole system yet. I would wait a week. 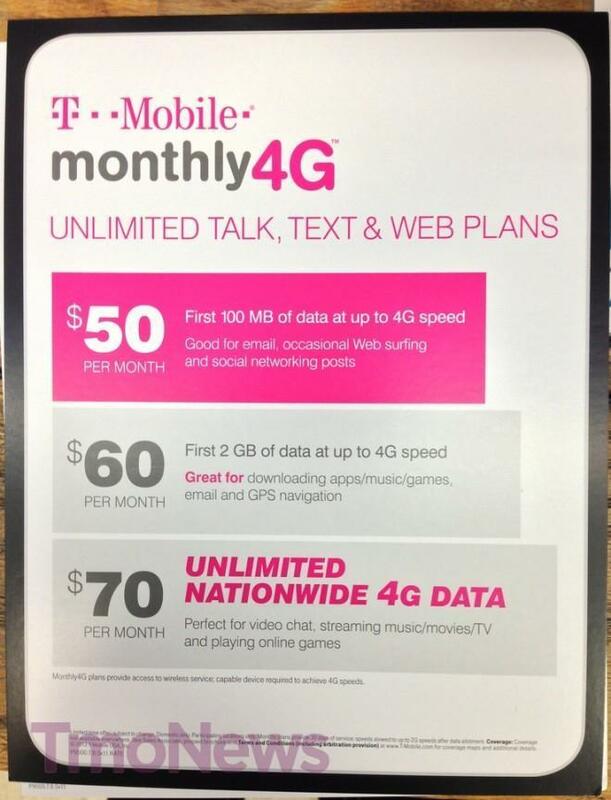 T-Mobile Confirms Monthly4G Unlimited Nationwide 4G Data Plan Going Live Tomorrow……….NOT. It works my 4g came back on two days ago after i used up all my 4g and it’s not even the 28th of the month yet. Now I’m satisfied. TY TMO!!!! By the way I’m at like 10g of data and 4g speeds are still going.